Rafael Nadal became the first man in tennis history to win eight titles at a Grand Slam championship on Sunday. Third seed Nadal is now the leading performer in Roland Garros history with a 6-3, 6-2, 6-3 victory over fellow Spaniard and fourth seed David Ferrer. He is 59-1 lifetime at the clay-court event in Paris. The last major final between two players from the same nation was at 2004 Roland Garros, when Argentine Gaston Gaudio beat Guillermo Coria. Six-time Olympic gold medallist Usain Bolt, the 100 metre world record-holder, presented La Coupe des Mousquetaires to the winner. ATPWorldTour.com analyses their 24th FedEx ATP Head2Head meeting (Nadal 20-4). Nadal established an early dominance by moving Ferrer side to side to secure the first break in the third game, but Ferrer bounced back immediately, settling early nerves when a 20-stroke rally ended with Nadal mis-timing a backhand long. Ferrer, the lighter of the two players, needed to return serve well and target Nadal’s backhand to stand a chance of making an impact. It worked for a time, before Nadal seized control of the baseline and positioned himself in the deuce court to operate his forehand. Nadal pushed Ferrer further back and at 3-3, he converted his first break point opportunity by ripping a backhand crosscourt winner past Ferrer, who was approaching the net off a backhand down the line. Nadal clinched the first set in 40 minutes with his third service break. Ferrer won 25 per cent of his second service points. When Ferrer returned to Nadal’s backhand he reaped dividends, keeping his compatriot on the back foot. Aggressive tennis from Ferrer earned him a break point opportunity in the opening game of the second set, but Nadal quickly regained control and broke serve for a 2-0 lead with another pinpoint accurate forehand winner. Once Ferrer has broken a six-game losing streak for 1-3, dozens of umbrellas around Court Philippe Chatrier were sheltering spectators from the drizzle. Three big forehands – two of which were hit when moving backwards – got Nadal out of trouble in a sixth game that featured four break points. At one stage, when Ferrer looked in control, Nadal highlighted his tremendous leg strength to end a 29-stroke rally en route to a 4-1 lead. The former World No. 1 then attempted to put his foot on the accelerator to stamp out Ferrer’s challenge as cloud cover lightened overhead. But his dominance was twice interrupted by protestors. Nadal, serving at 5-1, was broken to 15. 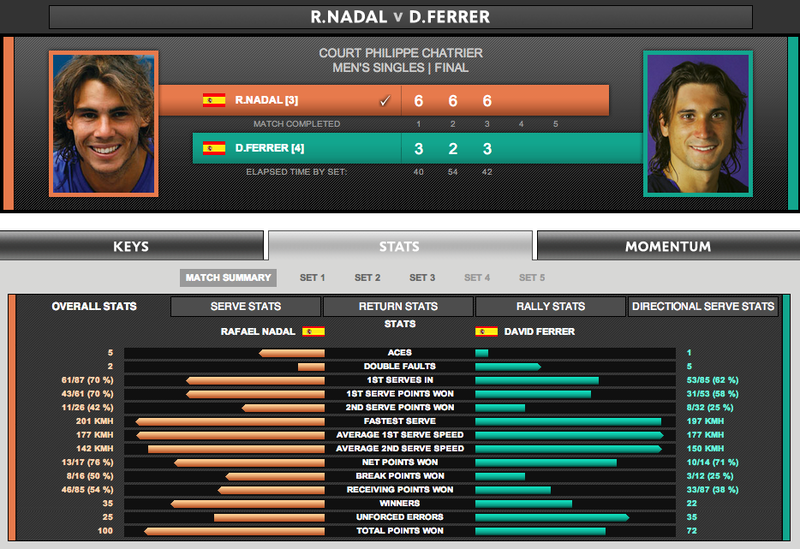 But it proved to be a temporary blip as Ferrer hit three successive errors to gift Nadal the second set in 54 minutes. Once again, Ferrer had struggled on second serve. Nadal seized the initiative by rushing up the court off forehand approaches. He won two of the first three games, but had his serve broken by Ferrer shortly before 5:00pm local time, when play was suspended for a few minutes due to rain. Ferrer, who wanted to go off court and consult with his coach Javier Piles, went on to level the score at 2-2. Nadal became agitated by the weather, rushing his strokes. Ferrer rushed due to the mounting pressure. Break points came and went, but returns consistently struck deep forced Ferrer into error. When he was broken to give Nadal a 5-3 lead, you wondered what was going through Nadal’s mind? Seventh months out through injury, but now a service game to win his 12th major crown. Off-balance, at 40/15, he struck a forehand winner to clinch his seventh title in his ninth tournament of 2013. He fell to the ground in celebration. The 'King of Clay' was humble in his appreciation of Ferrer’s performance over the past fortnight. The match lasted two hours and 16 minutes, ending at 5:30 p.m.